The Upper James provides some of the best smallmouth bass fishing in the east and maybe... the country. 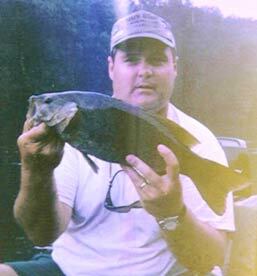 Your host, Brian Bodine, has been fishing the James for the last 20+ years and guiding on it for over a decade now. Fishing between the Rockfish and Hardware River tributaries, this stretch produces citation smallmouth (5 lbs. or 20 inches) year round. When the bite is on, 50 to 100 fish days are common. Brian Bodine fishes this stretch of the James year round. He can provide you with the local knowledge to get you on the fish and increase your chances on taking your own trophy smallmouth. 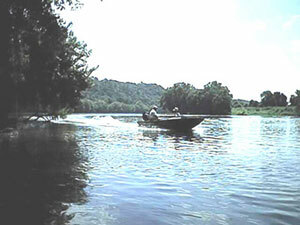 This area of the James provides ideal habitat for river smallmouth. Numerous rocks and ledges create plenty of structure for the smallmouth to lie in wait for their prey. It's because of this rocky water level that your average fiberglass bass boat would be useless. Our customized jetboat has a steel reinforced hull that is tunneled out allowing it to run in 4 inches of water. Pushed across the James by a Mercury Jet outboard, we can get you into areas that even the canoes cannot get to. And when we find the fish, unlike a raft, we can drift through a product area, motor up and come through it again! Our jetboat also adds a level of safety in that should a thunderstorm pop up, we are only a few minutes of being safely back at the landing. Full-day, includes 8 hours on the James, guide, boat and fuel, all bait, your rods or mine, soft drinks. Half-day, includes 4 hours on the James, guide, boat and fuel, all bait, your rods or mine, soft drinks. Businessman's Special, Mon. - Thurs. evenings leaving the Scottsville Boat Ramp at 5:30pm and fish till dark (@3 hrs of fishing). Drop us an email and ask to be put on the Razorback Fishing Report to get all the latest info on River conditions and fishing action.